The eyes in the sky don't belong just to Big Brother anymore. A proposed rule from the Federal Aviation Administration carves out new exemptions for commercial businesses to put drones in the sky. More than 500 of these special exemptions have been confirmed—including one for a Utah business named Stunning Heights. The photography company hopes not only to make a profit off its unique drone's-eye-view images but is also playing a role in helping to shape the way the budding field of commercial drone technology is regulated. Stunning Heights received its FAA exemption in May. Matthew Baker runs the company with his wife, Rebecca. A former Blackhawk helicopter pilot, Baker has the advantage of already possessing the necessary credentials for the FAA exemption. He wants his company's services to be as versatile as the technology itself—able to photograph homes and developments for realtors, inspect wind turbines and take aerial shots for film-production companies. In the near future, he would like approval to cover breaking news events and offer footage to media outlets. Given his pilot background, Baker realized he could get a head start in the drone business—but his interest goes deeper than that. "This kind of makes me sound a little bit full of myself," Baker says, "but I also saw this as a way to influence [the regulations] and make it a smoother transition." That smoother transition would be welcome in an industry whose outlets are often frustrated by the FAA's slow progress in setting down rules for commercial drones. University of Nebraska-Lincoln journalism professor Matt Waite founded the school's Drone Journalism Lab in 2011. Waite says the commercial-drone debate started in 2012 when Congress passed a law to modernize the FAA, calling for a system that would allow commercial drones by 2015. That hasn't happened yet. But the FAA has started offering a small number of exemptions to FAA rules, allowing some commercial drone uses. "It went glacially slow," Waite says. "But then, about a year ago, they granted the first six exemptions ... to Hollywood film companies—that opened the door." Since then, the exemptions have been approved in batches and have been gaining momentum, Waite says. Still, the exemptions come with key restrictions that are part of a proposed final rule that is currently under public consideration. The restrictions include limiting drone flight to within the operator's line of sight, and only in daylight hours. Special certifications likely will be required to operate drones. Currently, exemptions are allowed only for those who hold at least a light-sportcraft pilot's license—something Professor Waite is trying to acquire just to use drones. "I'm spending $6,500 to get this light-sport license this summer, and that's to fly a $200, three-pound hunk of plastic around," Waite says. 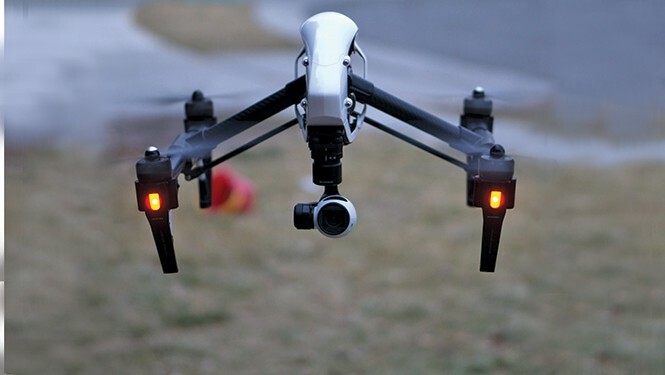 Baker, however, favors the FAA's caution, noting that licensed pilots have a better appreciation than others of how busy the airspace is, and pilots should test the industry out to help prevent any kinds of accidents that might set the drone industry back. "They're taking really proactive measures to hopefully avoid any huge thing that would cause reactive laws and guidelines," Baker says. "In the end, it's going to produce good results." Captain Jim Green, who is putting together a drone-certification course to be offered at Utah Valley University in 2016, also sees value in the FAA's caution. He understands why operators should prove they can control the vehicles safely, pointing out that if someone tried to film a sporting event and crashed even a small drone into a crowd, it could cause serious injuries. Still, Green doesn't think the technology requires the same oversight as a commercial airplane. "I don't think the FAA should have anything to do with it," Green says. "It should be a state issue. These are small devices that could be operated in our own backyards—they're not going to be flying high up in the way of airliners." Regardless of how the final rule shakes out, Baker is excited to begin operating now and helping to blaze a trail for the burgeoning industry. "It's going to be a wonderful and amazing field in the future, and it's just too exciting to not be a part of it now," Baker says.